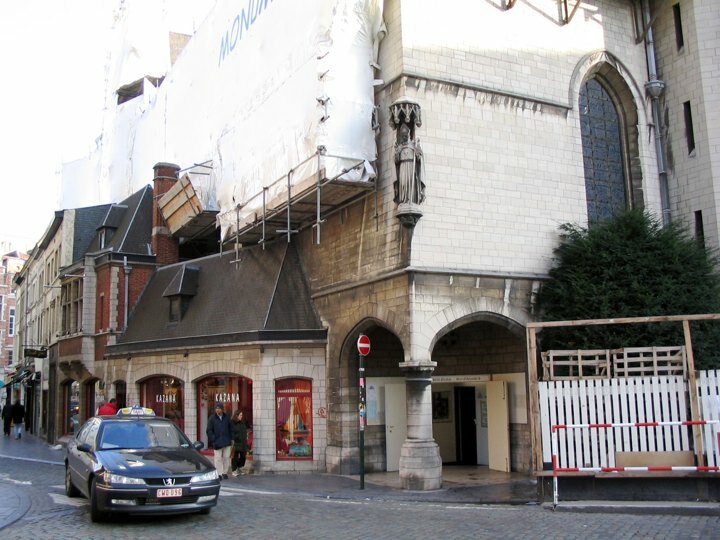 In Boterstraat / Rue au Beurre, in Brussels you find Église Saint-Nicholas, dedicated to the patron saint of the traders. This is hardly surprising as Grand Place, the city's trade center is located just around the corner. The church asymmetrical shape was created by an irregular and small brook that used to run through Boterstraat. The entrance dates back to the second half of the 12th century. The choir was completed in 1381 and the side-chapel, devoted to the Holy Virgin, was constructed in 1486. A special feature of this church is the old houses surrounding the church that have been preserved intact up to this day. 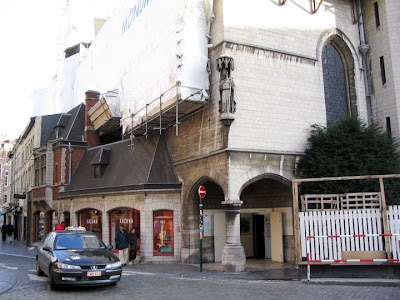 The church was plundered during the religious uproar in the 16th century and it burnt completely down in 1695 during the bombing of Brussels by the French troops. One of the pillars of the Holy Virgin chapel still holds a canon ball from that tragic event. In 1714 a Medieval high tower serving as the city belfry collapsed, killing 1 man and 1 pig. In 1929 a plan to demolish the church because it hindered the traffic in the Boterstraat was stopped. 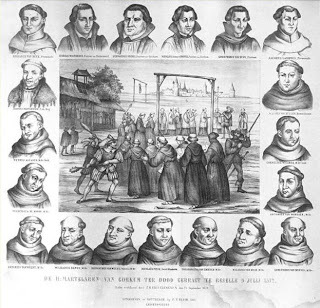 The relics of the so-called "martyrs of Gorkum" were transferred from Holland to the Saint-Nicholas church in 1868 and have, since then, been exposed to the public. These 19 martyrs (image right) were catholic priests that were tortured and executed on the 9th of July 1572 in the Dutch city of Gorinchem (or Gorkum) during conflicts between Catholics and Protestants in the Netherlands. The church also holds a small painting by Rubens of The Virgin and Child and the Vladimir Icon painted by an artist from Constantinople in 1131.